"Jamaica's monthly vintage entertainment magazine", as Vintage Boss describes itself, does not begin to measure its importance for all who value the rich heritage of Jamaican music. The last five years has seen Jamaican music and culture given its proper respect at long last through serious reference books such as Reggae: The Rough Guide, on television through the excellent recent Channel Four series in the UK to celebrate the 40th anniversary of Jamaican independence, and through such exhibitions as ReggaeXplosion in London and New Zealand. Nevertheless, the depth and range of visual material in Vintage Boss goes beyond anything hitherto made available in print. Published out of Trevennion Road, Kingston 5, the editorial team of Colby Graham & Canute Fagan have unrivalled access to rare and previously unseen archive material from Jamaican publications and private individuals. Such co-operation is clearly a tribute to the care and respect that the editors of Vintage Boss give back to the music. In the words of Colby Graham "The aim of the publication is to capture and present to the world, Jamaica's rich cultural past over the last half a century." Articles on major Jamaican artists such as Derrick Harriott and Jimmy Cliff are characteristically more detailed and rich in anecdote than elsewhere. The article on Jimmy Cliff gives the full story behind his arrest and imprisonment in Nigeria and his dispute with Chris Blackwell's Island Records, richly supported by archive photographs of Cliff at various stages of his career. Less documented artists of equal musical stature such as Myrna Hague are given the same respect and attention to detail. Vintage Boss also digs deep into the undocumented grass roots of Jamaican music and culture, regularly profiling long time Jamaican collectors of the music well known within the island's music fraternity but unknown outside the island. 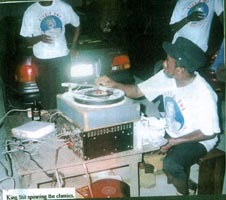 Such names as Neville Wray, currently DJ with KLAS FM 89 who started collecting in 1958 and whose first contact with the business was cutting holes in the chassis of tube amplifiers for a downtown business where Duke Reid and Sir Coxsone would have their own amps repaired. Or Roy Black whose show on the same station specialises in mento, calypso, boogie and R & B, the musical precursors to ska in Jamaica. Or Ossie Hamilton, friend of Bob Marley from the early 60s, who has the largest photo catalogue anywhere of Bob Marley's early years in the business. The stories of such men make up the story of Jamaican music itself. King Stitt spins the discs for Studio One's 2001 New Year's Eve party at 13 Brentford Road. Photograph copyright of Vintage Boss; reprinted here with permission. The role of the Alpha Boys School in the birth of the Skatalites and ska itself has been well documented in such books as Reggae: The Rough Guide and Bass Culture but characteristically Vintage Boss digs deeper than the rest. The magazine interviews Sister Mary Ignatius who joined the School in 1939, operating her own sound system the Mutt and Jeff Hi Fi from the late 50s: " I started inviting Tom the Great Sebastien and V Rocket sound systems to play at the sessions... many people became drunk and so I had to set aside a dormitory to which the boys would take the drunkards until they would recover". Where else will you read about a sound system run by a nun? Where else are you going to find a photo of King Stitt spinning the discs at 13 Brentford Road for Sir Coxsone's New Year's Eve party last year? Where else will you find a photo of Prince Buster sparring with Muhammad Ali at Norman Manley Airport in 1975? The price of Jamaican $250 or £10 sterling for each issue is money well spent just in terms of the visual material alone. For part of the delight of this magazine is the ephemera, the 1962 newspaper ad for a Morris Minor, the fliers and posters for bygone shows, the lists from back in the day of new releases and Top Tens from Randys Record Mart, JBC, Tip Top Record Centre and Beverly's Records. Proper respect is also paid to Jamaican institutions which do not necessarily have a direct connection with the island's music, such as Mico College, the recently closed Times Store, the Half Way Tree Church and the Carib Theatre. Animating every page of Vintage Boss is pride in the vitality and idiosyncratic spirit of Jamaican daily life and institutions, which more than ever needs to be asserted in the face of continuing overseas preoccupation with guns and political warfare in Jamaica. While devoted to the music of Jamaica's heritage, Vintage Boss does not neglect the present and devotes significant coverage to the current work of Jamaica's vintage greats. The July 2002 issue alone reviews the Main Event show at Mas Camp in Kingston, featuring Ruddy Thomas, Pat Kelly, Ken Boothe, Gregory Isaacs, the Mighty Diamonds, and Alton Ellis; the Heineken Startime show in St Ann featuring Derrick Morgan, Ken Boothe, Mighty Diamonds, George Nooks, Frankie Paul and John Holt; Ken Boothe at Priscilla's Night Club, Constant Spring Road. The point is made that Jamaica's vintage greats are still working as hard as ever and command a loyal audience both internationally and at home. Every month Vintage Boss also profiles young up and coming artists such as Warrior King, Abijah who in the words of the magazine "have been exhibiting a high level of professionalism, hard work and positive attitude". This magazine is indispensable for serious fans of Jamaican music from its origins in mento, R & B & shuffle through to the roots reggae heyday of the Seventies. It is also essential reading for anyone homesick for Jamaica or who simply loves the island and its people. Vintage Boss can be contacted at vintagecgja@yahoo.co.uk or at 10 Trevennion Road, Suite 66, Kingston 5, Jamaica, West Indies. Inquiries can also be made with this site at geoffjp@reggaezine.co.uk for purchase of Vintage Boss in the UK.